Calling the World Congress of Families a “nefarious and hateful group of extremists,” Human Rights Campaign President Chad Griffin held a press conference with local and international stakeholders in Salt Lake City today outside the Utah State Capitol Building. WCF, which says it “affirms and defends the natural family as the fundamental unit of civilizations,” will host its worldwide congress at the Grand America Hotel in Salt Lake City in October. Griffin also announced its sponsorship of a gathering of local leaders, citizens, and advocates that promotes a positive vision of LGBT people and their families. Set to begin just days before the WCF conference, HRC signed on as presenting sponsor of the second annual Inclusive Families Conference that group leaders say will aim to “preempt the deeply divisive and destructive anti-LGBT animus and collaboration of the anti-LGBT hate group and their affiliates.” The conference will take place Oct. 23 and 24 at the University of Utah College of Social Work. Alongside the announcement, HRC released a new edition of what it calls a “scathing report” on the organization, Exposed: The World Congress of Families. Though unable to attend the press conference, Salt Lake City Mayor Ralph Becker issued a statement in support of the Inclusive Families Conference. 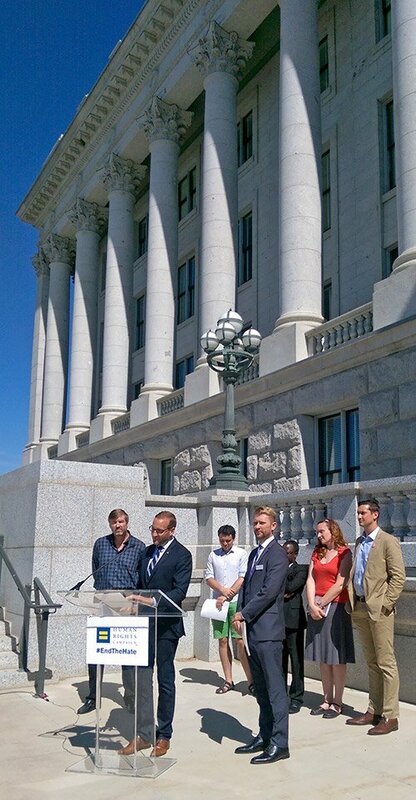 At today’s press conference, Griffin was joined by local advocates including Troy Williams, executive director of Equality Utah; Mary Stanley from the Inclusive Families Coalition; and Kent Frogley, Utah Pride Center board president. They were also joined by two international pro-equality activists whose lives have been deeply impacted by the exportation of anti-LGBT hatred abroad: Dmitry Chizhevsky from Russia, and Frank Mugisha, executive director of Sexual Minorities Uganda. In 2013, Chizhevsky was leaving an LGBT community meeting in St. Petersburg when assailants shot him with an air rifle, blinding him in his left eye. The attack happened in the wake of the passing of Russia’s anti-LGBT “propaganda” law. Chizhevsky says members of WCF, including the planning committee of the Salt Lake City Conference, have been actively involved in supporting Putin’s crackdown against LGBT people and their allies. When a Mother Jones reporter asked WCF managing director Larry Jacobs if WCF had contributed to the Russian crackdown on its LGBT citizens, Jacobs said, “Yes, I think that is accurate.” Chizhevsky is now seeking asylum in the U.S.
“Notorious anti-LGBT extremist Scott Lively, who has not only spoken at WCF events around the world, but has also participated in planning meetings in Moscow for a WCF conference in Russia, has traveled repeatedly to Uganda claiming that LGBT people are responsible for the Holocaust, the Rwandan genocide and the spread of HIV/AIDS,” Mugisha said. He and other prominent activists credit Lively with the creation of legislation to further criminalize homosexuality in Uganda. Lively is also currently facing a civil suit in the U.S. brought on by SMUG for alleged crimes against humanity. Mugisha calls WCF the “nerve center” of American extremists exporting anti-LGBT bigotry abroad. “No American should be in the business of exporting hate around the world,” Mugisha said. Labeled a hate group by the Southern Poverty Law Center, WCF is dedicated to promoting and coordinating the exportation of anti-LGBT bigotry, ideology, and legislation around the world. HRC’s newly updated report on the group, Exposed: The World Congress of Families, makes clear that the organization and many of its affiliates are laser-focused on promoting policies and rhetoric that put LGBT people and their families at incredible risk. Active across five continents, WCF has organized large international “pro-family” conventions that bring together a wide range of vehemently anti-LGBT activists. WCF’s activities range from holding conferences in Nigeria focused on denying rights to LGBT people to working to silence the Russian LGBT community. Earlier this year, HRC strongly condemned WCF for hiring notorious anti-LGBT activist Janice Shaw Crouse as the executive director for their Salt Lake City conference. Crouse’s record was highlighted in HRC’s report Exposed: The Export of Hate, in which she received a dishonorable mention. In the past, Crouse urged the Ugandan government to take a “biblical and cultural stand against the radical homosexual agenda” and traveled to Russia in support of the regime’s deeply anti-LGBT “propaganda” law. Stanley spoke of the Inclusive Families Conference, saying that the event was planned well before WCF announced its plans to come to Salt Lake. “We never intended to be anything else than what we are — a conference for all families,” she said. As clinical director of The Healing Group, she saw the damage done to children who are different in some way. “The sum of their being becomes their one difference,” she explained. She said that she believed in almost all of the planks of the WCF, but for the “one man, one woman” stance. “I know that God is good, and God is love — with no conditions,” she said. Frogley said that strong families are the hallmark of our state. Reality has hit. Happy birthday to me.